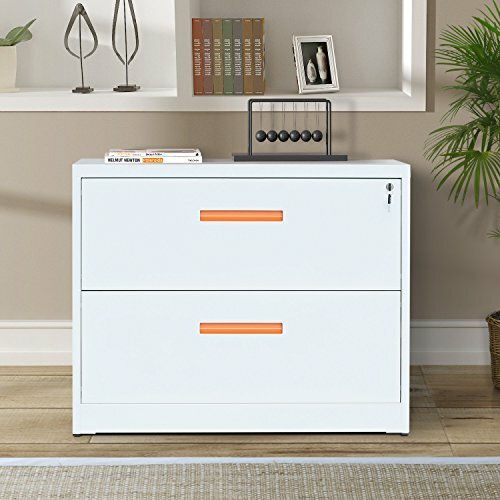 This lateral file cabinet is constructed of steel which is very durable and stable. The steel material stands up to years of rigorous use. It features 2 drawers with hanging file rails and the guide rail of drawer slides smoothly with the ball-bearing suspensions. You don't need to worry about hearing the nasty sound of opening a drawer. This is really a well-engineered and incredibly strong file cabinet. Need simple assembly and tools need to be prepared by yourself. Assembly required. Tools need to be prepared by yourself. We recommend to use electric screwdriver. Packaged with 2- layer corrugated cardboard boxed and 4 plastic corners prevent damage. This drawer slide in and out smoothly and have a locking mechanism which allows only one drawer to be open at a time. It also has a key lock for security. Each drawer not only offer large space to storage but also allows side to side letter, A4, or, legal file folders. If you have any questions about this product by ModernLuxe, contact us by completing and submitting the form below. If you are looking for a specif part number, please include it with your message.